Hip No. 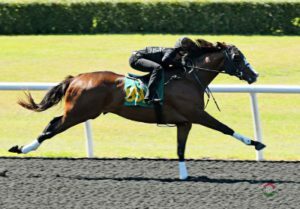 951, a son of Fast Anna consigned by Envision Equine, Agent, worked a quarter in :20 2/5 to post the fastest work at the distance at the fifth and final session of the Under Tack Show for the Ocala Breeders’ Sales Company’s 2019 Spring Sale of Two Year Olds in Training. The bay colt is out of Ballad, by Tapit, a daughter of stakes placed No Fair. Eight horses shared honors for the day’s fastest, eighth, stopping the timer in :9 4/5. Hip No. 935, Superbloodwolfmoon, a bay filly by Malibu Moon consigned by King’s Equine, Agent, is out of stakes placed A Story of Revenge, by Tale of the Cat, a half sister to grade one winner I Want Revenge. Hip No. 939, consigned by Randy Miles, Agent, a dark bay or brown colt by Street Boss, is a half brother to stakes placed Rousanne out of Auntie Soph, by Valiant Nature. Hip No. 943, a chestnut filly by Palace consigned by de Meric Sales, Agent, is a half sister to stakes winner Striking Tomisue out of Avenging Tomisue, by Belong to Me. Hip No. 998, a chestnut filly by Shackleford consigned by Randy Miles, Agent, is out of Borrowingbasebaby, by Dixie Union, a half sister to graded stakes placed stakes winner Mr Cub. Hip No. 1111, a dark bay or brown filly by Medaglia d’Oro consigned by Sequel Bloodstock, Agent, is a half sister to grade one stakes placed stakes winner Bajan out of stakes placed Critikal Reason, by Aptitude. Hip No. 1168, Takes a Village, a chestnut filly by Lakerville consigned by TIP Thoroughbred Investment Possibilities, Agent, is out of Don’t Despair, by High Brite, a half sister to stakes placed Zanie Reality. Hip No. 1179, Arithmetic, a bay colt by Algorithms consigned by Randy Bradshaw, Agent, is a half brother to graded stakes placed stakes winner Sumo out of graded stakes winner Dyna Da Wyna, by Doc’s Leader. Hip No. 1214, consigned by Woodford Thoroughbreds, Agent, a dark bay or brown colt by Flatter, is a half brother to stakes placed Janis’s Joy out of graded stakes placed stakes winner Ever Elusive, by Forestry. There were two quarters in :20 3/5. Hip No. 928, a bay filly by Competitive Edge consigned by Top Line Sales LLC, Agent, is a half sister to stakes winner Aarons Orient out of Are U Being Served, by Jambalaya Jazz. Hip No. 1106, consigned by Harris Training Center LLC, a bay colt by Emcee, is a half brother to graded stakes winner Calgary Caper out of Cowgirl Lucky, by Stephen Got Even. Hip No. 508, consigned by Hartley / de Renzo Thoroughbreds LLC, Agent, a bay filly by Warrior’s Reward, is a half sister to stakes placed Hyannisport out of Pure Desire, by Gold Legend. Hip No. 948, a chestnut filly by Wicked Strong consigned by Q Bar J Thoroughbreds LLC, is a half sister to stakes placed Quick Ride, out of Baby Lets Cruise, by Tale of the Cat. Hip No. 1050, consigned by Woodford Thoroughbreds, Agent, is a chestnut colt by Tapiture out of graded stakes placed stakes winner Champagne Ending, a half sister to grade one stakes winner Dark Ending. Hip No. 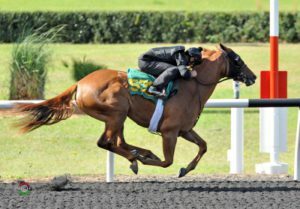 1136, a chestnut filly by Competitive Edge consigned by Hoppel’s Horse & Cattle Co., Inc., Agent, is out of Dayienu, by Sunday Break (JPN), a half sister to graded stakes placed Bushwhacked. Hip No. 1192, consigned by Wavertree Stables, Inc. (Ciaran Dunne), Agent, is a chestnut filly by Street Boss out of Edwina E, by Square Eddie, a full sister to stakes placed Rinse and Repeat and Electric Eddie. Hip No. 225, a bay filly by Lemon Drop Kid consigned by Wavertree Stables, Inc. (Ciaran Dunne), Agent, is out of Knysna, by Maria’s Mon, a half sister to graded stakes winner Seaspeak. Hip No. 926, also consigned by Wavertree Stables, Inc. (Ciaran Dunne), Agent, is a bay colt by Tonalist out of Arabian Song, by Forestry, a half sister to graded stakes placed Bodes Galaxy (IRE). Hip No. 971, a dark bay or brown colt by Oxbow consigned by de Meric Sales, Agent, is out of stakes winner Bella Cardona, by Bertrando, a half sister to stakes winner R El Jefe. Hip No. 1112, a dark bay or brown filly by Cairo Prince consigned by Eddie Woods, Agent, is a half sister to stakes winner Perfect Wife out of Crozat, by Street Sense. Hip No. 1118, a bay filly by Blame consigned by de Meric Sales, Agent, is a half sister to stakes placed My Savannah Belle out of Curry Cat, by Tale of the Cat. Hip No. 1165, also consigned by de Meric Sales, Agent, is a bay colt by Into Mischief out of Dixie Song, by Fusaichi Pegasus, a half sister to the dam of grade one winner By the Moon. Hip No. 1220, another from de Meric, is a bay filly by Into Mischief out of Eyes Wide Open, by Unbridled’s Song, and a half sister to stakes placed Real Steel. There were twenty-five eighths in :10 flat. Hip No. 916, consigned by TIP Thoroughbred Investment Possibilities, Agent, is a dark bay or brown filly by New Year’s Day out of Apalachee Song, by Songandaprayer, a half sister to champion Artax. Hip No. 930, a dark bay or brown filly by Twirling Candy consigned by Randy Miles, Agent, is out of Arousing, by Cee’s Tizzy, a daughter of graded stakes winner Soviet Problem. Hip No. 937, a chestnut colt by Flatter consigned by Top Line Sales LLC, Agent, is out of Atlantic Dream, by Stormy Atlantic, a full sister to graded stakes winner Icy Atlantic. Hip No. 959, a bay filly by Maclean’s Music consigned by McKathan Bros., Agent, is out of Bazinga Baby, by Afleet Alex, a daughter of stakes placed Elizaveta. Hip No. 960, consigned by Randy Miles, Agent, is a dark bay or brown colt by Violence out of champion Bear Now, by Tiznow, a daughter of graded stakes placed stakes winner Controlled. Hip No. 986, consigned by Kings Equine, Agent, is a dark bay or brown colt by Lemon Drop Kid out of stakes placed Blading Gold Ring, by During, a half sister to grade one stakes placed Emerald Gold. Hip No. 991, consigned by TIP Thoroughbred Investment Possibilities, Agent, is a bay filly by Into Mischief out of graded stakes winner Blueeyesintherein, by Magna Graduate, a half sister to graded stakes placed Set the Sail. Hip No. 992, a bay filly by Orb consigned by Off the Hook LLC, Agent, is out of stakes winner Bluegrass Sara, by Tabasco Cat. Hip No. 1007, a dark bay or brown colt by Shanghai Bobby consigned by Golden Rock Thoroughbreds, Agent, is out of Brush Up, by Broken Vow, a half sister to graded stakes winner Change Up. Hip No. 1012, consigned by G. A. Thoroughbred Sales, is a bay filly by Summer Front out of stakes placed Button Girl, by Mizzen Mast, a half sister to graded stakes winner Coracle. Hip No. 1017, consigned by Niall Brennan Stables, Agent, is a bay filly by Into Mischief out of stakes winner Callmethesqueeze, by Awesome Again, a half sister to stakes winner Royal Squeeze. Hip No. 1034, a dark bay or brown filly by Uncle Mo consigned by Crupi’s New Castle Farm, Agent, is a full sister to graded stakes winner Game Changer out of graded stakes placed stakes winner Cash’s Girl, by Northern Afleet. Hip No. 1049, a gray or roan colt by Cairo Prince consigned by Bobby Dodd, Agent, is a half brother to stakes winner Roxbury N Overton out of Centennial Cat, by Tale of the Cat. Hip No. 1066, consigned by Wavertree Stables, Inc. (Ciaran Dunne), Agent, is a bay colt by Candy Ride (ARG) out of graded stakes placed stakes winner Citizen Advocate, by Proud Citizen. Hip No. 1068, consigned by Julie Davies LLC, Agent, is a chestnut colt by Kantharos out of stakes placed City in Sky, by City Zip. Hip No. 1076, a bay filly by Lea consigned by Scanlon Training & Sales, Agent, is a half sister to stakes placed Sierra Aleone out of Clear March, by Vindication. Hip No. 1099, a dark bay or brown colt by Twirling Candy consigned by Off the Hook LLC, Agent, is out of Corinthian Luck, by Corinthian, a daughter of stakes winner Racing Luck. Hip No. 1128, Jim’s Bronze Star, consigned by Wavertree Stables, Inc. (Ciaran Dunne), Agent, is a chestnut filly by Midshipman out of Dancing Compass, by Orientate, a half sister to stakes placed Catsadiva. Hip No. 1134, a bay colt by Into Mischief consigned by Top Line Sales LLC, Agent, is a half brother to stakes placed Darling Sky out of Darling Mambo, by Broad Brush. Hip No. 1153, a bay colt by Into Mischief consigned by Sequel Bloodstock, Agent, is a half brother to graded stakes placed stakes winner Rush Now out of stakes placed Dirty Rush, by Wild Rush. Hip No. 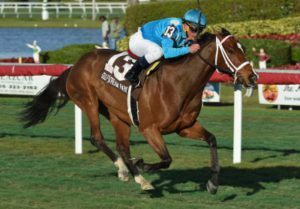 1156, a dark bay or brown colt by Itsmyluckyday consigned by Thoroughbred Champions Training Center LLC, is out of Distant Memories, by Wildcat Heir, from the family of stakes winner Lanzada. Hip No. 1161, consigned by Parrish Farms, Agent, is a chestnut filly by Shackleford out of Diva From Dixie, by Dixieland Band, a half sister to stakes winner Political Wife. Hip No. 1163, a dark bay or brown filly by Distorted Humor consigned by Kings Equine, Agent, is out of graded stakes winner Dixie City, by Dixie Union, a half sister to graded stakes placed stakes winner Win the War. Hip No. 1182, consigned by Grassroots Training & Sales LLC, Agent, a dark bay or brown colt by Constitution, is a half brother to stakes placed Four Inch Heels out of stakes placed Earlybird Road, by Cherokee Run. Hip No. 1206, consigned by Grassroots Training & Sales LLC, Agent, is a dark bay or brown filly by Commissioner out of Encore, by Storm Cat, and is a half sister to stakes placed Best Macho. Under Tack results and videos are posted on the OBS website at obssales.com and can be viewed on kiosks in the breezeway and in the Video Room adjacent to the Horsemen’s Lounge. In-room viewing is available at The Courtyard by Marriott, Homewood Suites, Hampton Inn & Suites, Residence Inn and the Ocala Hilton, plus lounge viewing is available at the Hilton. The Spring Sale begins on Tuesday, April 23rd at 12:00 noon instead of its originally scheduled 10:30 a.m. start to allow additional time for inspections. For more information regarding the Spring Sale or OBS website, please call (352) 237-2154. 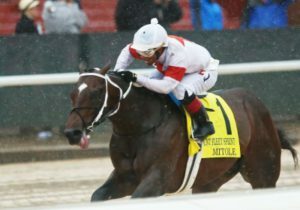 On the eve of the 2019 sale, OBS April graduates Wonder Gadot and Starship Jubilee are Sovereign Award winners as 2018 Canadian champions. 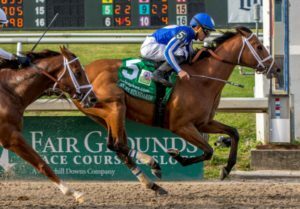 Colts by Dominus, Daddy Long Legs and Two Step Salsa posted the fastest works at their respective distances at the fourth session of the Under Tack Show for the Ocala Breeders’ Sales Company’s 2019 Spring Sale of Two Year Olds in Training. Hip No. 706, Speedy Justice, a bay colt by Dominus consigned by TIP Thoroughbred Investment Possibilities, Agent, sped an eighth in :9 3/5. 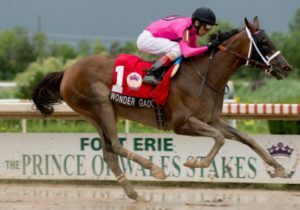 He’s out of Super Seller, by Came Home, a half sister to graded stakes winner T. D. Vance. Hip No. 647, a chestnut colt by Daddy Long Legs consigned by Coastal Equine LLC (Jesse Hoppel), Agent, turned in a quarter in :20 3/5. He’s out of Snow Fashion, by Old Fashioned, a daughter of stakes winner Snow Lass. Hip No. 865, a dark bay or brown colt by Two Step Salsa consigned by Blue River Bloodstock, Inc., Agent, worked three eighths in :32 2/5. He’s out of Zarlanz, by Harlan’s Holiday, a daughter to graded stakes placed stakes winner Zawzooth. Hip No. 678, consigned by Wavertree Stables, Inc. (Ciaran Dunne), Agent, a bay colt by Commissioner out of Star in the Corner, by Holy Bull, is a half brother to stakes winner Allanah. Hip No. 689, a dark bay or brown colt by Sky Mesa consigned by Hoppel’s Horse & Cattle Co., Inc., Agent, is out of Stormbeforethecalm, by Quiet American, a half sister to stakes winner Cool Catomine. Hip No. 703, consigned by Eddie Woods, Agent, a dark bay or brown colt by Conveyance, is a half brother to graded stakes winner Sunrise Smarty out of Sunrise Slew, by Seattle Slew. Hip No. 738, a gray or roan colt by Conveyance consigned by Top Line Sales LLC, Agent, is out of Tex Appeal, by Successful Appeal, a half sister to graded stakes winner Strait From Texas. Hip No. 760, a bay colt by Twirling Candy consigned by Wavertree Stables, Inc. (Ciaran Dunne), Agent, is out of Tough Market, by Suave, a half sister to stakes winner Law Enforcement. Hip No. 761, consigned by Southern Chase Farm, Inc. (Greg & Karen Dodd), Agent, is a chestnut filly by Majestic City, a half sister to Japanese stakes winner Ryono Tesoro, out of Town Belle, by Speightstown, a daughter of graded stakes winner Clearly a Queen. Hip No. 785, a chestnut colt by Kantharos consigned by Craig L. Wheeler, Agent, is out of Ukraine, by U S Ranger, a half sister to graded stakes winning OBS graduate Higher World. Hip No. 856, consigned by Ocala Stud, is a dark bay or brown colt by Street Boss out of Woodland Park, by Bernardini, a daughter of graded stakes winner Forest Heiress. Hip No. 898, a gray or roan colt by Liam’s Map consigned by Wavertree Stables, Inc. (Ciaran Dunne), Agent, is out of Amazement, by Bernardini, a daughter of grade one stakes winner Wonder Again. Hip No. 621, consigned by Eddie Woods, Agent, is a dark bay or brown colt by Justin Phillip out of Silent Fright, by Yes It’s True, a half sister to champion Grand Adventure. Hip No. 704, a gray or roan filly by American Pharoah consigned by Wavertree Stables, Inc. (Ciaran Dunne), Agent, is out of grade one winner Sunset Glow, by Exchange Rate. Hip No. 727, consigned by Top Line Sales LLC, Agent, is a chestnut filly by Wicked Strong out of Tap Twenty One, by Tapit, a half sister to No Mo Dough. Hip No. 826, a bay filly by Mr Speaker consigned by Wavertree Stables, Inc. (Ciaran Dunne), Agent, is out of Warrior Woman, by War Chant, a full sister to grade one stakes placed stakes winner War Monger. Hip No. 842, Tequila Gold, a dark bay or brown colt by Midshipman, consigned by Eddie Woods, Agent, is out of Wildcat Gold, by Forest Wildcat, from the family of champion Silverbulletday. There were four eighths in :9 4/5. Hip No. 655, Joy’s Rose, a dark bay or brown filly by Constitution consigned by Bobby Dodd, Agent, is a half sister to graded stakes placed Gotti out of Soot Z, by Empire Maker. Hip No. 658, a bay filly by Munnings consigned by Coastal Equine LLC (Jesse Hoppel), Agent, is out of stakes placed Sounds of the City, by Street Cry (IRE), a half sister to graded stakes placed stakes winner Pool Winner. Hip No. 789, consigned by Julie Davies LLC, Agent, a bay colt by Ghostzapper out of graded stakes placed Underwater, by Theatrical (IRE), is a half brother to graded stakes placed Investissement. Hip No. 792, a dark bay or brown filly by Bayern consigned by Richardson Bloodstock, Agent, is out of Union Boss, by Dixie Union, a daughter of stakes winner Capitol View. Twenty-one youngsters worked eighths in :10 flat. Hip No. 609, a dark bay or brown colt by Munnings consigned by S G V Thoroughbreds LLC (Steven Venosa), Agent, is a half brother to stakes placed Vertrazzo out of stakes winner She’ll Heir, by Wildcat Heir. Hip No. 620, a gray or roan colt by City Zip consigned by Woodford Thoroughbreds, Agent, is out of graded stakes placed Sikara (IRE), by Aussie Rules, from the family of grade one stakes winner Tarascon. Hip No. 653, a chestnut colt by Sky Mesa consigned by Craig L. Wheeler, Agent, is out of Song and Delight, by Songandaprayer, a half sister to OBS April graduate champion Delightful Mary. Hip No. 657, consigned by Whitman Sales LLC, Agent, is a bay colt by Strong Mandate out of Souci Girl, by Bluegrass Cat, a half sister to graded stakes winner River Seven. Hip No. 665, Tales I Winit, a bay filly by Forty Tales consigned by Sequel Bloodstock, Agent for Chester & Mary Broman, is out of Spinit to Winit, by Hard Spun, a daughter of stakes placed Prophetically. Hip No. 668, consigned by All Dreams Equine, a chestnut filly by Kitten’s Joy out of Spirit Line, by Indian Charlie, is a full sister to stakes winner Sassy Kitten. Hip No. 700, a bay filly by Blame consigned by Cary Frommer LLC, Agent, is out of Summer On the Lawn, by First Defence, a half sister to graded stakes winner Summer Applause. Hip No. 710, consigned by Niall Brennan Stables, Agent, is a bay filly by Congrats out of stakes winner Surtsey, by Heatseeker (IRE), a daughter of stakes placed Kick’em Jenny. Hip No. 717, consigned by Bobby Dodd, Agent, is a bay colt by Palace out of graded stakes placed stakes winner Sweet Problem, by Is It True. Hip No. 729, a bay colt by The Factor consigned by Off the Hook LLC, Agent, is a half brother to stakes winner Planchart out of graded stakes placed Tarrip, by Green Desert. Hip No. 757, consigned by Scanlon Training & Sales, Agent for Excel Bloodstock (Bruno DeBerdt), is a chestnut filly by Kantharos out of Torch Me, by Gimmeawink, a half sister to Belmont Stakes (G1) winner Da’Tara. Hip No. 807, a bay colt by Tapiture consigned by Grassroots Training & Sales LLC, Agent, is a half brother to stakes placed Perpetual Novena out of Viola Blew By, by Omega Code, a daughter of stakes winner Mighty Rose. Hip No. 822, a bay filly by Malibu Moon consigned by Wavertree Stables, Inc. (Ciaran Dunne), Agent, is out of Wampum Girl, by Exchange Rate, a half sister to grade one winner Bordonaro. Hip No. 834 , consigned by Eisaman Equine, Agent, is a bay colt by Into Mischief out of White Pants Night, by Speightstown, a half sister to graded stakes winner Hebbronville. Hip No. 841, a bay filly by Twirling Candy consigned by Robert Brewer, Agent, is out of Wild About Sonny, by Officer, a half sister to stakes winner My Due Process. Hip No. 847, a bay filly by Bernardini consigned by Randy Bradshaw, Agent, is a half sister to grade one winner Stormello out of Wilshewed, by Carson City. Hip No. 852, consigned by McKathan Bros., Agent, is a chestnut colt by Bayern out of graded stakes placed stakes winner Winning Season, by Lemon Drop Kid, a daughter of graded stakes winner Topicount. Hip No. 889, a dark bay or brown filly by Tale of the Cat consigned by de Meric Sales, Agent, is out of Allons Danser, by Eskendereya, a half sister to stakes placed Southern Truth. Hip No. 895, consigned by Scanlon Training & Sales, Agent, is a chestnut filly by City Zip out of Alpha Centauri, by Dynaformer, and is a half sister to stakes placed Reversethedecision. Hip No. 906, consigned by Paul Sharp, Agent, is a dark bay or brown colt by Temple City out of stakes placed Anahauc, by Henny Hughes, a half sister to stakes winner Gangbuster. Hip No. 907, a bay filly by Into Mischief consigned by Cary Frommer LLC, Agent, is out of And Away We Go, by Awesome Again, a daughter of grade one winner Queens Court Queen. The Under Tack Show continues at 8:00 a.m. on Sunday, April 21, with Hip No’s 913 – 1221 scheduled to breeze, horses originally scheduled for Friday and Saturday. Hip No. 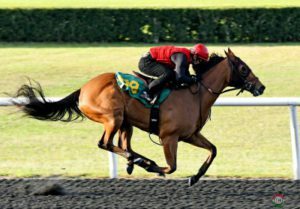 532, a daughter of Carpe Diem consigned by Wavertree Stables, Inc. (Ciaran Dunne), Agent, worked a quarter in :20 3/5 to post the fastest work at the distance at the third session of the Under Tack Show for the Ocala Breeders’ Sales Company’s 2019 Spring Sale of Two Year Olds in Training. The chestnut filly is out of Rebuke, by Carson City, a half sister to stakes winner Summer Cruise. Five horses shared honors for the session’s fastest eighth, stopping the timer in :9 4/5. Hip No. 444, a bay filly by Quality Road consigned by de Meric Sales, Agent, is a half sister to graded stakes winner Decelerator out of Paris Rose, by Accelerator, a half sister to the dam of Pegasus World Cup (G1) winner City of Light. Hip No. 453, consigned by Scanlon Training & Sales, Agent for Excel Bloodstock (Bruno DeBerdt), is a bay colt by Speightstown out of Pay Lady, by Seeking the Gold, and is a full brother to grade one stakes winner Lighthouse Bay. Hip No. 478, consigned by Best A Luck Farm LLC, Agent, a bay filly by Danza out of Polish Silk, by Polish Pro, is a half sister to stakes winner I Got It All. Hip No. 517, a bay filly by Bayern consigned by Harris Training Center LLC, Agent, is out of Queenie Cat, by Storm Cat, a half sister to champion Vindication. Hip No. 538, consigned by S G V Thoroughbreds LLC (Steven Venosa), Agent, a bay filly by Malibu Moon, is a half sister to stakes winner Red Hot Buddha out of Red Hot Bertie, by Tabasco Cat. Sixteen horses worked quarters in :21 flat. Hip No. 447, Ms. Malevolence, a dark bay or brown filly by Violence consigned by Classic Bloodstock LLC, Agent, is out of Parvati, by Dixieland Band, from the family of graded stakes winner Darby Shuffle. Hip No. 451, a bay filly by Bodemeister consigned by Wavertree Stables, Inc. (Ciaran Dunne), Agent, is a half sister to stakes placed Bad Read Sanchez out of Past Twilight, by Pulpit. Hip No. 457, a chestnut colt by New Year’s Day consigned by Altamira Stable LLC, Agent, is out of Pearl Is Discreet, by Discreet Cat, a daughter of stakes winner Duck Trap. Hip No. 481, a bay colt by Congrats consigned by Tom McCrocklin, Agent, is a full brother to graded stakes placed stakes winning OBS graduate Toasting out of Ponderway, by Prized. Hip No. 487, consigned by Woodford Thoroughbreds, Agent, is a chestnut colt by Competitive Edge out of Praviana, by Tapit, a half sister to graded stakes winner Livin Lovin. Hip No. 496, a bay colt by Competitive Edge consigned by Golden Rock Thoroughbreds, Agent, is a half brother to stakes placed Composed out of stakes winner Princess Composer. Hip No. 520, consigned by Hoppel’s Horse & Cattle Co., Inc., Agent, is a dark bay or brown filly by Uncaptured out of Queen of Scots, by Impeachment, a half sister to graded stakes winning OBS graduate Duke of Mischief. Hip No. 527, a bay colt by Competitive Edge consigned by Eddie Woods, Agent, is out of graded stakes placed Rapid Ransom, by Red Ransom, and is a half brother to graded stakes placed Rare Ransom (GB). Hip No. 529, consigned by de Meric Sales, Agent, is a chestnut colt by More Than Ready out of Reading Room, by Indian Charlie, a daughter of stakes placed Gingham and Lace. Hip No. 540, a bay daughter of Palace consigned by Hoppel’s Horse & Cattle Co., Inc., Agent, is out of Red River Jane, by Street Cry (IRE), from the family of graded stakes winner Tiger’s Eye. Hip No. 544, consigned by Envision Equine, Agent, is a bay colt by Palace out of Reposessed, by Jump Start, a half sister to stakes winner Daisy Dukes. Hip No. 562, a bay colt by Adios Charlie consigned by Southern Chase Farm, Inc.(Greg & Karen Dodd), Agent, is out of Royalesque, by Chapel Royal, a half sister to graded stakes placed stakes winner A Shin Wezen. Hip No. 567, consigned by Envision Equine, Agent, is a chestnut colt by Chitu out of Rumble Seat, by Mr. Greeley, a daughter of graded stakes winner Sister Star. Hip No. 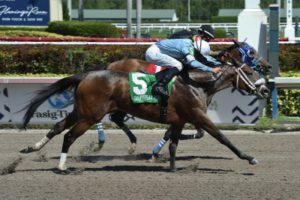 580, Lover Boy, consigned by Journeyman Bloodstock Services, Inc. (Brent & Crystal Fernung), Agent, a dark bay or brown colt by Fury Kapcori, is a half brother to graded stakes placed stakes winner Sweet Belle out of Sanibel Sole, by Miswaki. Hip No. 597, a dark bay or brown colt by Point of Entry consigned by Eddie Woods, Agent, is out of See Me Dance, by Unbridled’s Song, a daughter of grade one stakes winner Tap to Music. Hip No. 608, consigned by Jose Munoz, Agent, is a bay colt by Wicked Strong out of Shelby’s Song, by Songandaprayer, from the family of graded stakes winner Senior Investment. There were twenty-one eighths in :10 flat. Hip No. 422, consigned by Eisaman Equine, Agent, is a gray or roan filly by Karakontie (JPN) out of stakes placed Oblivious, by Cozzene, and is a half sister to stakes winner Street Storm. Hip No. 424, a bay colt by Quality Road consigned by TIP Thoroughbred Investment Possibilities, Agent, is out of Oh She’s So On, by Not For Love, a half sister to stakes winner Storm Play. Hip No. 429, a bay colt by City Zip consigned by Brick City Thoroughbreds, Agent, is out of One for London, by Eskendereya, a half sister to graded stakes winner Nicole H.
Hip No. 438, a dark bay or brown filly by Bayern consigned by Hidden Brook, Agent, is out of Overseen, by First Defence, a daughter of grade one stakes placed stakes winner Jibe. Hip No. 446, consigned by Kings Equine, Agent for Spendthrift Farm LLC, a gray or roan filly by Temple City, is out of Part of the Charm, by Tapit, a full sister to graded stakes winner Dancinginherdreams. Hip No. 468, also consigned by Brick City, is a gray or roan filly by Mineshaft out of Platinum Bride, by Alphabet Soup, a daughter of graded stakes placed stakes winner Pia Bride. Hip No. 482, consigned by Wavertree Stables, Inc. (Ciaran Dunne), Agent, is a bay filly by Justin Phillip out of Pontificating, by Gio Ponti, a half sister to graded stakes winner Sweet Hope. Hip No. 503, a bay filly by Uncaptured consigned by Hawks Nest LLC, is out of Proud Brush, by Proudest Romeo, a half sister to stakes winner Fabulous Brush. Hip No. 518, a bay filly by Street Boss consigned by Ends Well, Agent, is a half sister to stakes placed King Cyrus out of Queen of Empire, by Empire Maker. Hip No. 523, also consigned by Kings Equine, Agent for Spendthrift Farm LLC, is a bay colt by Medal Count out of graded stakes placed stakes winner Quiet Success, by Successful Appeal. Hip No. 535, consigned by Julie Davies LLC, Agent, is a chestnut filly by Commissioner out of Red Brunette, by Exclusive Quality, a half sister to graded stakes winner Devilish Lady. Hip No. 542, Pertinent, a chestnut filly by Speightstown consigned by Harris Training Center LLC, Agent, is out of Relevant, by War Front, a half sister to graded stakes winner Carve. Hip No. 543, a bay colt by Competitive Edge consigned by Cary Frommer LLC, Agent, is out of Repeat, by Bernardini, a half sister to graded stakes winner J Boys Echo. Hip No. 555, a bay colt by Chitu consigned by All In Sales (Tony Bowling), Agent, is out of stakes winner Rockin On, by Swiss Yodeler, a daughter of stakes winner To The Post. Hip No. 559, Deep Diver, a dark bay or brown filly by Daredevil consigned by Equest Thoroughbreds, Inc., is out of Rough Water, by Stormin Fever, a daughter of graded stakes winner Panama Canal. Hip No. 565, also consigned by Julie Davies, a bay filly by Honor Code out of Ruby’s Realm, by Empire Maker, is a half sister to graded stakes placed Currency Converter. Hip No. 569, consigned by Grassroots Training & Sales LLC, Agent, is a bay filly by Lea out of Run Lady Run, by Cherokee Run, from the family of champion Phone Chatter. Hip No. 571, a bay colt by Goldencents consigned by Harris Training Center LLC, Agent, is out of Running Debi C, by Unbridled’s Song, a daughter of graded stakes placed stakes winner Kris’ Sis. Hip No. 583, consigned by Old South Farm LLC, Agent, is a bay filly by Commissioner out of Sarah Avery, by Broken Vow, from the family of grade one winner Chief Honcho. Hip No. 594, a bay colt by Elusive Quality consigned by Randy Miles, Agent, is out of stakes placed Seeking Sheba, by Seeking the Gold, from the family of champion Perfect Soul (IRE). Hip No. 604, consigned by Peggy S. Delheim LLC, Agent, is a chestnut filly by Chitu out of Shanghai Rose, by Red Bullet, a half sister to graded stakes winner Malakoff. Due to a forecast of heavy rain on Friday and high winds on both Friday and Saturday, the Friday and Saturday Under Tack sessions are cancelled. On Thursday, Hip No.’s 609-912, selling on the sale’s third day, April 25th, will breeze. On Sunday Hip No.’s 913-1221, selling on the sale’s final day, April 26th, will breeze. The Thursday and Sunday sessions will begin at 8:00 a.m.
Tuesday’s first sale session will begin at 12 noon to provide buyers additional time for inspection. Sales results will be available on the OBS website, updated hourly during each session of the March Sale. In addition, the latest news regarding OBS graduates, sales schedules, nominations, credit requests, travel information and other news relevant to OBS consignors and customers is also available. E-mail should be addressed to obs@obssales.com. Enjoying ideal conditions, a colt by Amira’s Prince (IRE) and a filly by Commissioner sped quarters in :20 1/5 to share honors for the fastest work at the distance at the second session of the Under Tack Show for the Ocala Breeders’ Sales Company’s 2019 Spring Sale of Two Year Olds in Training. Hip No. 240, consigned by Blue River Bloodstock, Inc., Agent, is a dark bay or brown colt by Amira’s Prince (IRE) out of Lady Halite, by Medaglia d’Oro, from the family of graded stakes winning OBS graduate Buffalo Man. Hip No. 365, a bay filly by Commissioner consigned by Q Bar J Thoroughbreds LLC, is out of Money Madness, by Rahy, a half sister to stakes placed Feminine Girl. Four youngsters shared credit for the session’s fastest eighth, stopping the timer in :9 4/5. Hip No. 242, a bay colt by Sky Mesa consigned by Top Line Sales LLC, Agent, is out of Lady Lavery, by Elusive Quality, a half sister to graded stakes winner Skylighter. Hip No. 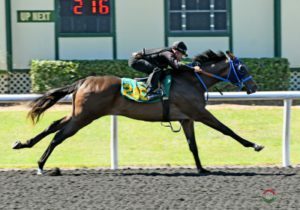 281, also consigned by Top Line Sales LLC, Agent, is a dark bay or brown filly (GB) by Make Believe (GB) out of stakes winner Lisselan Diva (FR), by Barathea, a full sister to stakes winner Vinthea (IRE). Hip No. 319, a bay colt by Blame consigned by Crupi’s New Castle Farm, Agent, is out of Marie Antoinette, by Stormy Atlantic, a half sister to stakes winner Crimson China. Hip No. 386, Racial Harmony, a gray or roan filly by The Factor consigned by Nice and Easy Thoroughbreds, Agent, is out of stakes winner My Redbyrd, by Royal Academy, a half sister to grade one winner Ocean Ridge. Hip No. 285, a bay colt by Majesticperfection consigned by Woodford Thoroughbreds, Agent, is out of stakes placed Liza Too, by Olmodavor, a half sister to grade one stakes winner Paulassilverlining. Hip No. 330, consigned by Niall Brennan Stables, Agent, is a bay filly by Into Mischief out of grade one stakes winner Meadow Breeze, by Meadowlake, and is a half sister to grade one stakes placed Royal Copy. Three horses were clocked in :20 4/5. Hip No. 265, consigned by Whitman Sales LLC, Agent, is a chestnut colt by Anthony’s Cross out of Leonarda, by Rockport Harbor, from the family of stakes winner Valid Linda. Hip No. 357, a chestnut filly by Union Rags consigned by Eddie Woods, Agent, is a half sister to graded stakes winner Secret Gypsy out of Miss Utada, by Rahy. Hip No. 389, consigned by Wavertree Stables, Inc. (Ciaran Dunne), Agent, is a bay colt by Into Mischief out of My Sky, by Sky Mesa, a half sister to graded stakes winner Unitarian. Seven horses worked quarters in :21 flat. Hip No. 207, consigned by Wavertree Stables, Inc. (Ciaran Dunne), Agent, is a chestnut colt by Hard Spun out of stakes winner Katerbug, by Pulpit, a half sister to stakes winner Outplay. Hip No. 218, also consigned by Wavertree, is a bay filly by The Factor out of Kind Turn, by Street Cry (IRE), from the family of graded stakes winner Miss Turkana. Hip No. 284, Lively Kitten, a dark bay or brown Kitten’s Joy filly consigned by Eddie Woods, Agent, is out of Lively Lexi, by Giant’s Causeway, a daughter of champion Chopinina. Hip No. 321, a bay colt by Tiznow consigned by de Meric Sales, Agent, is a half brother to grade one stakes winner Promises Fulfilled out of graded stakes placed Marquee Delivery, by Marquetry. Hip No. 346, consigned by Woodside Ranch, Agent, is a chestnut colt by Race Day out of Miss Euphoria, by Aragon (IRE), from the family of graded stakes winner Distinction. Hip No. 361, another from Wavertree, is a bay filly by Declaration of War out of Moanin (FR), by Medicean, a daughter of graded stakes winner Seltitude. Hip No. 404, also from the Wavertree consignment, a chestnut colt by Fed Biz, is a half brother to stakes winner Street Gem out of Nesselrode, by Lemon Drop Kid. There were twenty-seven eighths in :10 flat. Hip No. 212, a dark bay or brown colt by Bayern consigned by Paul Sharp, Agent, is out of Key Is to Win, by Dixie Union, a daughter of stakes placed Cabbage Key. Hip No. 224, a chestnut filly by Flat Out consigned by Costanzo Sales, is a half sister to graded stakes winner Hembree out of Knockatrina, by Langfuhr. Hip No. 245, consigned by Best A Luck Farm LLC, Agent, a bay filly by Karakontie (JPN), is a half sister to champion Jaywalk out of Lady Pewitt, by Orientate. Hip No. 246, a dark bay or brown colt by Street Boss consigned by Crupi’s New Castle Farm, Agent, is a half brother to graded stakes placed Percolator out of Lady Rushmoore, by Wild Rush. Hip No. 249, a chestnut colt by First Samurai consigned by Off the Hook LLC, Agent, is a half brother to graded stakes winner Decorated Soldier out of graded stakes winner Lakenheath, by Colonial Affair. Hip No. 252, consigned by Off the Hook LLC, Agent, is a dark bay or brown colt by Wicked Strong out of Lastaria, by Five Star Day, from the family of stakes winner Cayenne Red. Hip No. 255, a bay Kitten’s Joy filly consigned by Niall Brennan Stables, Agent, is out of graded stakes placed Laureldean Gale, by Grand Slam, a half sister to graded stakes winner Secret History. Hip No. 271, Taste of Diamonds, a dark bay or brown filly by Cairo Prince consigned by TIP Thoroughbred Investment Possibilities, Agent, is out of champion Light Cat, by Indygo Shiner. Hip No. 291, consigned by S B M Training and Sales, Agent, a gray or roan filly by Competitive Edge, is a half sister to stakes winner Veaisha out of stakes winner Love Co, by Not For Love. Hip No. 298, a dark bay or brown filly by Pioneerof the Nile consigned by Hartley / DeRenzo Thoroughbreds LLC, Agent, is out of Maggie d’Oro by Medaglia d’Oro, a half sister to graded stakes winner Gaff. Hip No. 300, dark bay or brown Competitive Edge filly consigned by Mayberry Farm, Agent, is out of stakes winner Magical Solution, by Stormin Fever, a half sister to grade one winner The Lumber Guy. Hip No. 301, consigned by S G V Thoroughbreds LLC (Steven Venosa), Agent, is a dark bay or brown filly by Twirling Candy out of stakes placed Magnificent Shirl, by Heatseeker (IRE), a half sister to graded stakes placed Fantastic Song. Hip No. 308, consigned by Paul Sharp, Agent, is a chestnut colt by Tale of the Cat out of Majestique, by Majestic Warrior, a half sister to stakes winner Northern Station. Hip No. 312, a bay filly by Paynter consigned by Eisaman Equine, Agent, is out of stakes placed Mallory Street, by Street Sense, a half sister to stakes placed Eloquent Tribute. Hip No. 318, consigned by Julie Davies LLC, Agent, is a gray or roan filly by Cairo Prince out of Maria’s Storm, by Maria’s Mon, from the family of graded stakes placed stakes winner Mshawish. Hip No. 324, a dark bay or brown colt by Fed Biz consigned by McKathan Bros., Agent, is out of Marvelous Me, by Capote, a half sister to grade one stakes winner Mandy’s Gold. Hip No. 340, Vow to Be Pretty, a bay filly by Broken Vow consigned by Timber Creek, Agent, is out of Miso Pretty, by Forest Wildcat, from the family of graded stakes winner Judge T C.
Hip No. 341, consigned by Sequel Bloodstock, Agent, is a dark bay or brown filly by Freud out of Miss Accord, by A. P Jet, a half sister to grade one stakes winner Buy the Sport. Hip No. 342, a bay colt by Bayern consigned by Equinox, Inc., Agent, is out of Miss Ann Perry, by Afleet Alex, a daughter of stakes placed Clary Sage. Hip No. 347, a gray or roan Mizzen Mast filly, consigned by Whitman Sales LLC, Agent, is a half sister to graded stakes winning OBS April graduate A Shin Bullseye out of Miss Fear Factor, by Siphon (BRZ). Hip No. 350, a bay colt by Central Banker consigned by Niall Brennan Stables, Agent, is out of Miss Moultree, by Uncle Mo, from the family of graded stakes placed stakes winner America America. Hip No. 351, a bay colt by Constitution consigned by Eisaman Equine, Agent, is out of stakes winner Miss Narcissist, by Freud, a full sister to stakes placed Fenwick Hall. Hip No. 358, consigned by Marcial Galan, is a bay filly by The Big Beast out of Mitasunke, by Closing Argument, and is a half sister to stakes placed Woot Woot. Hip No. 368, a dark bay or brown colt by Palace Malice consigned by Old South Farm LLC, Agent, is a half brother to stakes winner Daddy Justice out of Moon Beamy, by Malibu Moon. Hip No. 373, a gray or roan filly by Mizzen Mast consigned by Randy Miles, Agent, is out of More Hoping, by North Light (IRE), a daughter of stakes placed Just Hoping. Hip No. 392, consigned by Top Line Sales LLC, Agent, is a dark bay or brown colt by Candy Ride (ARG) out of stakes placed My Super Nova, by Super Saver, a full sister to stakes winner Star Super. Hip No. 394, a chestnut filly by Algorithms consigned by Crupi’s New Castle Farm, Agent, is out of Mythical, by Dixieland Band, a daughter of stakes winner Majestic Legend. Hip No. 400, consigned by Mayberry Farm, Agent, is a bay colt by Twirling Candy out of Natalie Grace, by First Dude, a half brother to graded stakes winner Bahamian Squall. The Under Tack Show continues at 8:00 a.m. on Wednesday, April 17, with Hip No’s 407 – 608 scheduled to breeze. 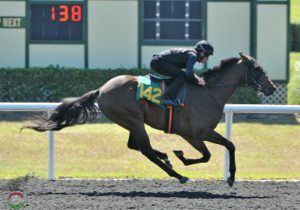 Battling a persistent headwind throughout the day, fillies by Danza, Fast Anna and Twirling Candy worked quarters in :21 flat to share honors for the fastest work at the distance at the opening session of the Under Tack Show for the Ocala Breeders’ Sales Company’s 2019 Spring Sale of Two Year Olds in Training. Hip No. 115, consigned by Envision Equine, Agent, is a bay filly by Fast Anna out of graded stakes placed Hermione’s Magic, by Forest Wildcat, and is a half sister to stakes placed Tizanillusion. Four horses shared honors for the session’s fastest eighth, stopping the timer in :10 flat. Hip No. 6, consigned by Hartley / DeRenzo Thoroughbreds LLC, Agent, is a bay filly by Shanghai Bobby out of stakes winner Fast Resource, by Bob and John, from the family of OBS graduate and leading sire Into Mischief. Hip No. 129, also consigned by Hartley / DeRenzo Thoroughbreds LLC, is a dark bay or brown filly by Daredevil, a half sister to champion Judy the Beauty out of stakes winner Holy Blitz, by Holy Bull. Hip No. 1, a dark bay or brown colt by Blame consigned by All in Line Stables, Agent, is out of Facethefront, by War Front, a half sister to graded stakes winner Ball Four. Hip No. 18, consigned by Eddie Woods, Agent, is a bay filly by Secret Circle out of Flawless Trinket, by Tribal Rule, a half sister to stakes placed Golden Artemis, dam of grade one stakes winning OBS graduate My Conquestadory. Hip No. 70, Mister K, a chestnut colt by Kantharos consigned by Blue River Bloodstock, Inc., Agent, is out of Goodgollymissdolly, by Pleasant Tap, from the family of stakes winner Camptown Dancer. Hip No. 65, consigned by Eddie Woods, Agent, is a dark bay or brown filly by Shakin It Up out of Gold Ring, by Touch Gold, a half sister to stakes winner Smoke It Right. Hip No. 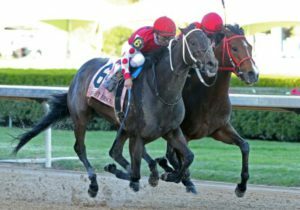 74, a gray or roan colt The Factor consigned by Thoroughbred Champions Training Center LLC, is out of Gracewood, by Unbridled’s Song, from the family of graded stakes winner Eight Belles. Hip No. 162, a dark bay or brown colt by Commissioner consigned by Top Line Sales LLC, Agent, is out of Inner Groove, by Rock Hard Ten, from the family of graded stakes placed stakes winning OBS April graduate Pacific Gale. Hip No. 177, also consigned by Eddie Woods, Agent, is a bay colt by Twirling Candy out of graded stakes placed Jacky Halo (ARG), by Southern Halo, and is a half brother to graded stakes winner Renacere (ARG). Hip No. 11, a dark bay or brown colt by Fed Biz consigned by Eddie Woods, Agent, is out of Fiercely, by Hard Spun, a half sister to stakes winner Ex Pirate. Hip No. 35, consigned by Ocala Stud, is a dark bay or brown filly by Summer Front out of Frolicking Gal, by Discreet Cat, a half sister to graded stakes winner Azar. Hip No. 54, a chestnut daughter of City Zip consigned by Envision Equine, Agent, is out of Giulio’s Jewel, by Speightstown, a half sister to graded stakes placed Duff One. Hip No. 59, a bay filly by Khozan consigned by Journeyman Bloodstock Services, Inc. (Brent & Crystal Fernung), Agent, is out of Glitterazi, by Hard Spun, a half sister to graded stakes placed stakes winner Super Fuse. Hip No. 93, consigned by Eddie Woods, Agent, is a bay filly by Palace out of Harborinthetempest, by More Than Ready, a daughter of stakes winner Kresgeville. Hip No. 117, a gray or roan filly by Sky Kingdom consigned by Wavertree Stables, Inc. (Ciaran Dunne), Agent, is out of graded stakes placed stakes winner Heykittykittykitty, by Tactical Cat. Hip No. 124, consigned by Q Bar J Thoroughbreds LLC, Agent, is a dark bay or brown filly by Palace Malice out of Hi Lili, by Silver Deputy, and is a half sister to stakes placed Conquest Bigluck E.
Hip No. 203, a bay colt by Flatter consigned by Hoppel’s Horse & Cattle Co., Inc., Agent, is out of stakes winner Karakorum Elektra, by Freud. There were sixteen eighths in :10 1/5. Hip No. 5, a gray or roan filly by Race Day consigned by Grassroots Training & Sales LLC, is out of stakes winner Fast Deal, by Grand Slam. Hip No. 23, K Top King (KOR), consigned by de Meric Sales, Agent, is a chestnut colt by Ecton Park out of Fly Top Queen, by Henny Hughes, from the family of graded stakes winner Inexplicable. Hip No. 37, a bay filly by Quality Road consigned by Eisaman Equine, Agent, is out of Frost Bite, by Pulpit, a half sister to grade one stakes winner Bustin Stones. Hip No. 42, Chart, consigned by Harris Training Center LLC, Agent, is a bay filly by Lea out of Gauge, by War Front, a half sister to graded stakes winner Brilliant. Hip No. 58, a bay colt by Kantharos consigned by TIP Thoroughbred Investment Possibilities, Agent, is out of Glitterama, by Rock Hard Ten, a daughter of stakes winner May Day Vow. Hip No. 62, consigned by Altamira Stable LLC, Agent, is a dark bay or brown filly by Constitution out of Gold D’Medaglia, by Medaglia d’Oro, a half sister to stakes winner Close to the Edge. Hip No. 73, a bay colt by Twirling Candy out of stakes winner Graceful Cat, by Forest Wildcat, is consigned by S G V Thoroughbreds LLC (Steven Venosa), Agent. Hip No. 76, a bay filly by Carpe Diem consigned by Top Line Sales LLC, Agent, is a half sister to stakes winner Salmanazar out of Grandtessa, by Grand Slam. Hip No. 91, consigned by S B M Training and Sales, Agent, is a dark bay or brown colt by Mission Impazible out of Happy Retreat, by More Than Ready, a half sister to graded stakes placed stakes winner Crossing Point. Hip No. 125, consigned by Randy Miles, Agent, is a chestnut filly by Orb out of stakes winner His Beauty, by Adcat, and is a half sister to graded stakes placed stakes winner Temper Mint Patty. Hip No. 145, consigned by Top Line Sales LLC, Agent, is a bay colt by Fed Biz out of Icee Sara, by Eskimo, and is a half brother to stakes placed Norjac. Hip No. 149, a bay colt by Elusive Quality consigned by Bobby Dodd, Agent, is a half brother to stakes placed Mezzano out of Im Cruising Dixie, by Dixie Union. Hip No. 157, consigned by McKathan Bros., Agent, is a bay colt by Into Mischief out of grade one stakes placed stakes winner Indian Gracey, by Indian Ocean. Hip No. 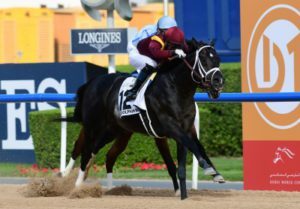 187, a dark bay or brown colt by Lemon Drop Kid consigned by Grassroots Training & Sales LLC, is out of stakes winner Joffe’s Run, by Giant’s Causeway, a daughter of graded stakes placed stakes winner Laguna Seca. Hip No. 194, consigned by Top Line Sales LLC, Agent, is a bay colt by First Samurai out of stakes placed Juke, by Mr. Prospector, and is a half brother to graded stakes winner Haka. Top Line Sales also consigned Hip No. 201, a bay colt by Race Day out of Just Married, by Awesome Again, a daughter of graded stakes winner Love N’ Kiss S.
The Under Tack Show continues at 8:00 a.m. on Tuesday, April 16, with Hip No’s 204 – 406 scheduled to breeze. 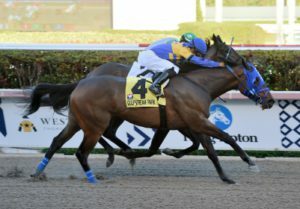 April Sale graduates were first and third in a pair of Saturday stakes races. Michael Dubb, Madaket Stables LLC and Bethlehem Stables LLC’s World of Trouble tracked the leaders wide down the backstretch of Aqueduct’s $400,000 Carter Handicap (G1) on Saturday, swept toward the front on the turn, opened daylight in the stretch and coasted home a winner by half a length. 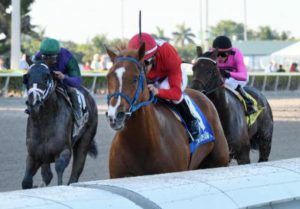 It’s the first graded stakes win for the 4-year-old Florida-bred colt by Kantharos, trained by Jason Servis, now 11-7-2-1 with $891,400 in earnings. Consigned by Darsan Inc., Agent, he went through the ring at the 2016 OBS August Yearling Sale. 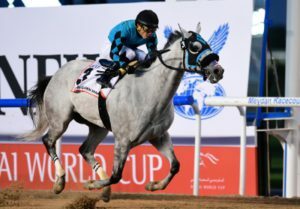 It was a good day in the desert for OBS graduates, with X Y Jet taking the Golden Shaheen (G1) and Coal Front scoring in the Godolphin Mile (G2) on Dubai World Cup Day at Meydan. It’s the eighth victory in the Golden Shaheen (G1) by an OBS graduate. Mind Your Biscuits took the last two renewals, following Secret Circle (2015), Big City Man (2009), Saratoga County (2005) and Caller One in 2001 and 2002. 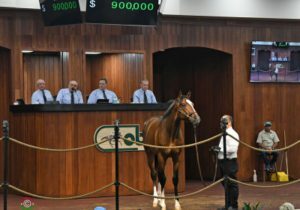 For the session, 147 horses sold for a total of $21,291,000, compared with 128 horses bringing $21,948,000 at last year’s second session. The average price was $144,837, compared with $171,469 last year while the median price was $95,000 compared with $120,000 in 2018. The buyback percentage was 25.4%; it was 28.1% a year ago. For the entire sale, 309 horses sold for $44,422, 500 compared with 257 bringing $42,275,000 a year ago. The average price was $143,762 compared with $164,494 in 2018 while the median price was $80,000 compared with $105,000 a year ago. The buyback percentage was 23.1%; it was 29.2% in 2018. The next sale at OBS is the Spring Sale of 2-Year-Olds in Training, set for April 23rd through April 26th with Under Tack Shows scheduled for April 15th through April 20th. Sales results are available on the OBS website, updated hourly during each session of the March Sale. In addition, the latest news regarding OBS graduates, sales schedules, nominations, credit requests, travel information and other news relevant to OBS consignors and customers is also available. E-mail should be addressed to obs@obssales.com. 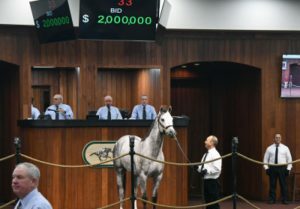 For the session, 144 horses sold for a total of $22,134,000, compared with 129 bringing a total of $20,327,000 last year. The average was $153,708 compared to $157,574 in 2018 while the median price was $83,500 compared with $95,000 a year ago. The buyback percentage was 29.8%; it was 30.3% in 2018. The March Sale continues Wednesday, March 13th at 10:30 a.m. with Hip No.’s 289 – 577 set to go through the ring. Sales results are available on the OBS website, updated frequently during each session of the March Sale. In addition, the latest news regarding OBS graduates, sales schedules, nominations, credit requests, travel information and other news relevant to OBS consignors and customers is also available. E-mail should be addressed to obs@obssales.com. Hip No. 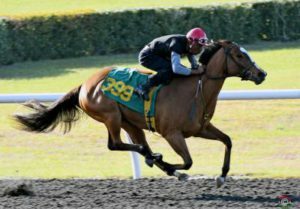 399, Angelcents, a daughter of Goldencents consigned by Blazing Meadows Farm LLC, Agent, sped a quarter in :20 2/5 to post the fastest work at the distance at the third and final session of the Under Tack Show for the Ocala Breeders’ Sales Company’s 2019 March Sale of Two Year Olds in Training. The bay filly is out of Pomeroy Angel, by Pomeroy, a half sister to stakes winner City Sage. Hip No. 418, a dark bay or brown colt by The Big Beast consigned by L.G., Agent, breezed the session and entire Under Tack Show’s fastest eighth, stopping the timer in :9 3/5. He’s out of Raebear, by Our Emblem, a half sister to graded stakes placed Speed Hawk. Hip No. 495, a gray or roan colt by Discreet Cat consigned by Eddie Woods, Agent, turned in a quarter in: 20 3/5. He’s a half brother to stakes winner Sir Genghis out of Staria, by Unbridled’s Song. Six horses worked quarters in :20 4/5. Hip No. 388, consigned by Ocala Stud, a bay colt by Prospective out of Pentelicus Gold, by Pentelicus, is a half brother to stakes placed Final Step. Hip No. 485, a bay colt by Goldencents consigned by Woodford Thoroughbreds, Agent, is a half brother to stakes placed Catsadiva out of Song’n Dance, by Carson City. Hip No. 486, Man of Vision, consigned by Journeyman Bloodstock Services, Inc. (Brent & Crystal Fernung), Agent, is a dark bay or brown colt by Fury Kapcori out of Sophia, by Lion Heart, a half sister to stakes winner Bourbon County. Hip No. 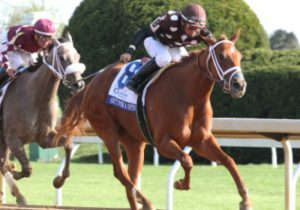 521, a chestnut filly by Uncaptured also consigned by Ocala Stud, is out of Sweetly Valid, by Sweetsouthernsaint, a daughter of stakes winner Valid Forbes. Hip No. 531, a bay son of Malibu Moon consigned by Southern Chase Farm, Inc. (Greg & Karen Dodd), Agent, is out of Tashzara (IRE), by Intikhab, a half sister to grade one winner Excelebration (IRE). Hip No. 569, consigned by Eddie Woods, Agent, is a chestnut filly by Tapiture out of Wild Debutante, by Forest Wildcat, a full sister to grade one stakes placed stakes winner Wildcat Brief. Hip No. 398, consigned by Brick City Thoroughbreds, is a chestnut filly by Maclean’s Music out of Polyantha, by Charismatic, a half sister to graded stakes winner Tessa Blue. Hip No. 493, a bay More Than Ready colt consigned by Woodford Thoroughbreds, Agent, is out of Spinning Time, by Giant’s Causeway, a daughter of graded stakes winner Turning Wheel. Hip No. 544, a bay filly by Commissioner also consigned by Brick City Thoroughbreds, is out of Tregrandibambini, by Stonesider, a half sister to graded stakes placed stakes winner Willet. Hip No. 567, a dark bay or brown colt by Tale of the Cat consigned by Eddie Woods, Agent, is out of Whispering, by Quiet American, from the family of champion Martessa (GER). Hip No. 570, consigned by de Meric Sales, Agent, is a bay filly by Honor Code out of Wild Idle, by Seeking the Gold, a daughter of champion Storm Song and a half sister to grade one stakes placed Trojan Nation. Hip No. 387, a bay daughter of Tapiture consigned by S B M Training and Sales, Agent, is a half sister to stakes placed Joevia, second in Aqueduct’s Jimmy Winkfield Stakes since the catalog was printed, out of Peace Process, by War Front. Hip No. 499, consigned by Brick City Thoroughbreds, is a chestnut filly by Mineshaft out of Sterling Forest, by Forest Wildcat, a daughter of stakes winner Tangier Sound. Hip No. 546, a bay filly by Fast Anna consigned by de Meric Sales, Agent, is out of True Will, by Yes It’s True, from the family of champion Hidden Lake. Hip No. 575, consigned by Old South Farm LLC, Agent, is a dark bay or brown filly by Mineshaft out of Witch Tradition, by Holy Bull, and a half sister to graded stakes winner Go Forth North. There were 23 eighths in :10 flat. Hip No. 390, consigned by S B M Training and Sales, Agent, is a dark bay or brown filly by Palace Malice out of Perfectly Natural, by Forestry, a full sister to graded stakes placed stakes winner Devereux. Hip No. 409, a bay colt by Dialed In consigned by Parrish Farms, Agent, is out of Pure Refinement, by In Excess (IRE), a half sister to grade one winner Pure As Gold out of stakes winner Pure Wool. Hip No. 412, a chestnut filly by Will Take Charge consigned by de Meric Sales, Agent, is a half sister to stakes placed Inspeightof out of stakes winner Quick Flip, by Speightstown. Hip No. 416, also consigned by de Meric Sales, Agent, is a bay filly by Into Mischief out of Race Hunter, by Dixie Union, a half sister to graded stakes winner Paid Up Subscriber. Hip No. 422, a dark bay or brown colt by Medaglia d’Oro consigned by King’s Equine, Agent, is out of stakes placed Rashnaa, by Tapit, a half sister to stakes winner Mistda. Hip No. 427, a dark bay or brown filly by Orb consigned by S B M Training and Sales, Agent, is a half sister to graded stakes winner Race Day out of Rebalite, by More Than Ready. Hip No. 428, a bay son of Biondetti consigned by ABG Warrior Racing Stable, Agent, is out of Rebooted, by Mr. Greeley, a full sister to grade one stakes placed Rebuttal. Hip No. 430, consigned by Harris Training Center LLC, Agent, is a chestnut colt by Competitive Edge out of Reina Diamante, by Pulpit, a daughter of graded stakes winner Bridge Game and a half sister to stakes placed Shalako, third in the recent Bernardini Stakes at Aqueduct. Hip No. 435, a bay daughter of Into Mischief consigned by King’s Equine, Agent, is out of Ricketyracketyruss, by Borrego, a half sister to graded stakes winner Broken Dreams. Hip No. 447, a bay colt by Jack Milton consigned by Golden Noguez, Agent, is out of Sam’s Roman Affair, by Roman Ruler, a half sister to graded stakes winner Rezif. Hip No. 456, My Testimony, consigned by S B M Training and Sales, Agent, is a bay filly by Mr Speaker out of Scribbling Sarah, by Freud, a full sister to graded stakes placed Jung Man Scott. Hip No. 466, consigned by Halcyon Hammock Farm, Agent, is a bay filly by Into Mischief out of stakes winner She’s Sensational, by Point Given, and a half sister to graded stakes placed stakes winner Our Way. Hip No. 476, Life On the Edge, a bay daughter of Competitive Edge consigned by CM Thoroughbreds, is a half sister to stakes winner Bear’s Gem out of Simply Precious, by Ascot Knight. Hip No. 477, a bay colt by Twirling Candy consigned by Wavertree Stables, Inc. (Ciaran Dunne), Agent, is out of Simply Sunny, by Unbridled’s Song, a half sister to grade one stakes placed stakes winner Reveron. Hip No. 504, consigned by Harris Training Center LLC, Agent, is a chestnut filly by Will Take Charge out of Stormy Tak, by Stormy Atlantic, a daughter of grade one stakes winner Lady Tak. Hip No. 536, a gray or roan colt by Mission Impazible consigned by Sequel Bloodstock, Agent for Chester & Mary Broman, is out of Thatza Wrap, by Hard Spun, from the family of graded stakes winner Vegas Prospector. Hip No. 537, a bay filly by Khozan consigned by Journeyman Bloodstock Services, Inc. (Brent & Crystal Fernung), Agent, is out of The Ghost Bride, by Ghostzapper, from the family of grade one winner Memories of Silver. Hip No. 550, consigned by Robert Brewer, Agent, is a bay colt by Into Mischief out of Under Wraps, by Dixie Union, a full sister to grade one stakes winner Overanalyze. Hip No. 551, Memorable, a bay colt consigned by Crupi’s New Castle Farm, Agent, is out of Unforgettable, by Empire Maker, a half sister to graded stakes winner Academy Award. Hip No. 562, consigned by KT Thoroughbreds, Agent, is a bay filly by Twirling Candy out of Water of Life, by Hennessy, and a half sister to stakes placed Wealth Effect. Hip No. 571, a dark bay or brown filly by Verrazano consigned by Eddie Woods, Agent, is a half sister to Takeittotheedge out of Willathewest, by Gone West. Hip No. 572, a bay filly by Sky Kingdom consigned by Golden Rock Thoroughbreds, Agent, is a half sister to stakes placed Peachy Kiss out of Willie Brook, by Montbrook. Hip No. 577, consigned by S G V Thoroughbreds LLC, is a bay colt by Competitive Edge out of W W Old School, by Royal Academy, and a half brother to stakes placed Dubdubwatson. The two-day March Sale is for Tuesday and Wednesday, March 12th and 13th, with both sessions beginning at 10:30 a.m. Hip 1 – 288 will sell on Tuesday; Hips 289 – 577 will sell on Wednesday. Hip No. 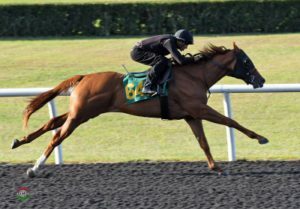 305, a chestnut filly by Super Saver consigned by Woodford Thoroughbreds, Agent, worked a quarter in :20 2/5 to post the fastest work at the distance at the second session of the Under Tack Show for the Ocala Breeders’ Sales Company’s 2019 March Sale of Two Year Olds in Training. She’s out of graded stakes placed OBS graduate Macha, by Majestic Warrior, a half sister to graded stakes placed stakes winner Maldita Primavera. Hip No. 350, a son of Biondetti consigned by Julie Davies LLC, Agent, turned in a quarter in :20 3/5. The chestnut colt is out of Natural Glow, by Siphon (BRZ), a daughter of graded stakes placed Blushing Deed. Six youngsters worked quarters in :20 4/5. Hip No. 214, a bay filly by Khozan consigned by Journeyman Bloodstock Services, Inc. (Brent & Crystal Fernung), Agent, is out of Henny Betty, by Henny Hughes, a half sister to graded stakes placed stakes winner Somethinaboutbetty. Hip No. 223, consigned by Tom McCrocklin, Agent, is a chestnut colt by First Dude out of Home in Time, by Came Home, from the family of champion Will Take Charge. Hip No. 226, a dark bay or brown colt by Include consigned by Top Line Sales LLC, Agent, is out of Homesick Angel, by Divine Park, a daughter of stakes winner On the Menu. Hip No. 302, a bay daughter of The Big Beast consigned by Ocala Stud, is out of Lucky Trip, by Trippi, a full sister to grade one stakes placed stakes winning OBS March graduate Candrea. 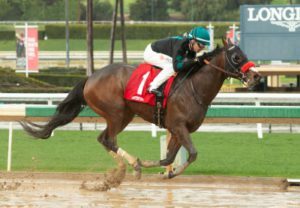 The filly by The Big Beast is also a half sister to OBS graduate I Am the Danger, who set a track record on February 3rd at Santa Anita, winning a 5-1/2 furlong allowance in 1:01.64. Hip No. 307, consigned by Wavertree Stables, Inc. (Ciaran Dunne), Agent, a dark bay or brown filly by Commissioner, is a half sister to stakes placed Legacy Reserve out of Magnet, by Seeking the Gold, a daughter of graded stakes winner Irish Linnet. Hip No. 344, a bay filly by The Big Beast consigned by Tom McCrocklin, Agent, is out of My Coastie, by Trippi, from the family of graded stakes placed stakes winning OBS graduate Honey’s Answer. Eight horses turned in quarters in :21 flat. Hip No. 85, consigned by Southern Chase Farm, Inc. (Greg & Karen Dodd), Agent, is a bay filly by Big Drama, a full sister to stakes placed OBS March graduate Drama Club out of Charity Event, by Grand Slam. Hip No. 148, a gray or roan colt by Palace consigned by Eddie Woods, Agent, is out of Elvies Lane, by Mr. Greeley, a half sister to graded stakes placed stakes winner In the Slips. Hip No. 193, consigned by de Meric Sales, Agent, is a dark bay or brown filly by Mr Speaker out of Goalkeeper, by Arch, from the family of grade one stakes winner Gold Fever. Hip No. 196, a bay colt by Twirling Candy consigned by All Dreams Equine, Agent, is out of stakes winner Grace Phil, by Philanthropist, from the family of graded stakes placed stakes winner Julie’s Witt. Hip No. 217, a bay colt by Justin Phillip consigned by Woodford Thoroughbreds, Agent, is out of grade one stakes placed stakes winner High Heeled Hope, by Salt Lake, and is a half brother to graded stakes winner Sweet Hope and a full brother to Lady T N T, second in the Dixie Belle at Oaklawn in February. Hip No. 222, a chestnut colt by Carpe Diem consigned by Eddie Woods, Agent, is out of Holy Place, by Pulpit, a half sister to champion Lady Eli. Hip No. 250, consigned by de Meric Sales, Agent, a bay daughter of Malibu Moon, is a half sister to graded stakes placed Imperial Council out of graded stakes placed stakes winner Jaramar Rain, by Thunder Gulch. Hip No. 362, a bay colt by Secret Circle consigned by Tom McCrocklin, Agent, is out of Not Affiliated, by Tale of the Cat, from the family of graded stakes placed Silver Spook. Twelve horses shared honors for the session’s fastest eighth, stopping the timer in: 9 4/5. Hip No. 198, a bay colt by Stay Thirsty consigned by Omega Farm, Agent, is out of graded stakes placed stakes winner Granny Mc’s Kitten, by Kitten’s Joy, a full sister to grade one stakes winner Kitten’s Dumplings. Hip No. 206, Gotta Go Mo, consigned by Sequel Bloodstock, Agent for Chester & Mary Broman, is a bay filly by Uncle Mo out of stakes winner Hard to Stay Notgo, by More Than Ready. Hip No. 230, a bay colt by Into Mischief consigned by Halcyon Hammock Farm, Agent, is out of Hysterical, by Distorted Humor, a daughter of graded one stakes winner Tout Charmant. Hip No. 232, a dark bay or brown colt by Race Day consigned by Top Line Sales LLC, Agent, is out of stakes placed Ile St Jaycee, by Ile St Louis (CHI), and is a half brother to stakes placed Rockport Street. Hip No. 235, Bravo Gato, consigned by Nice and Easy Thoroughbreds, Agent, is a chestnut colt by Discreet Cat out of I’m Not Afraid, by Maria’s Mon, a half sister to graded stakes placed stakes winner Silver Ocean. Hip No. 255, a bay filly by Uncaptured consigned by S G V Thoroughbreds LLC, is out of Jim’s Lonesa, by Put It Back, a half sister to stakes winner Who What Win. Hip No. 277, consigned by de Meric Sales, Agent, is a chestnut filly by Majestic City out of Landing My Way, by Southern Image, a half sister to graded stakes placed stakes winning OBS graduate Daring Reality. Hip No. 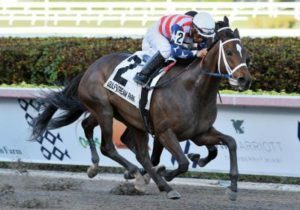 281, a dark bay or brown Midshipman filly consigned by S G V Thoroughbreds LLC, is out of Lead Me Not, by Speightstown, from the family of graded stakes winner Trouble Kid. Hip No. 326, a dark bay or brown Secret Circle colt consigned by McKathan Bros., Agent, is out of Miss Barrister, by Deputy Minister, a daughter of stakes winner Bay Barrister. Hip No. 346, Wisely to Fair, a dark bay or brown filly by Uncle Mo consigned by Top Line Sales LLC, Agent, is out of My Fast One, by Elusive Quality, a three quarter sister to stakes winner No Mo Dough. Hip No. 374, a bay filly by Union Rags also consigned by de Meric Sales, Agent, is a half sister to graded stakes winner I’m a Looker out of Our Mariella, by Victory Gallop. There were 25 eighths in :10 flat. Hip No. 201, a dark bay or brown colt by Munnings out of Hailey d’Oro, by Medaglia d’Oro, a daughter of stakes winning Chit Chat Pam, is consigned by All Dreams Equine, Agent. Hip No. 203, consigned by Woodford Thoroughbreds, Agent, is a chestnut colt by The Big Beast out of Halo’s Helen’s Jet, by Halo’s Image, a daughter of stakes placed OBS graduate Miss Vermont Jet. Hip No. 207, a bay colt by Normandy Invasion consigned by Crupi’s New Castle Farm, Agent, is out of Harlan Light, by Artie Schiller, a daughter of stakes winner Curious Conundrum. Hip No. 210, a chestnut filly by Daredevil consigned by Golden Rock Thoroughbreds, is out of Heartbeat Again, by Mr. Greeley, a half sister to grade one winner Appealing Zophie. Hip No. 212, consigned by King’s Equine, Agent, is a bay colt by American Pharoah out of graded stakes placed Heart of Paradise, by More Than Ready, from the family of graded stakes winning OBS March graduate Megascape. Hip No. 216, a bay colt by Kitten’s Joy consigned by Wavertree Stables, Inc. (Ciaran Dunne), Agent, is a full brother to graded stakes winner Csaba out of High Chant, by War Chant. Hip No. 220, a bay colt by Fast Anna consigned by Julie Davies LLC, Agent, is out of Hit the Limit, by Uncle Mo, from the family of grade one stakes winner Summerly. Hip No. 228, Sweet Belen, consigned by Golden Noquez, Agent, is a dark bay or brown filly by Khozan out of Hotuttable, by Untuttable, a full sister to stakes winner Arealhotlover. Hip No. 238, consigned by Robert Brewer, Agent, is a dark bay or brown filly by Empire Maker out of Indian Tale, by Tale of the Cat, from the family of graded stakes winner Clever Power. Hip No. 252, consigned by Hemingway Racing and Training Stables LLC, Agent, is bay colt by Tapiture out of Jazz in the City, by Temple City, a daughter of stakes winner Jazzy J J. Hip No. 257, a bay daughter of Tapiture consigned by Woodford Thoroughbreds, Agent, is out of J P’s Flashy OneyHonehHoney, by Flashy Bull, a half sister to graded stakes placed stakes winner Impending Bear. Hip No. 268, Not Phar Now, consigned by Sequel Bloodstock, Agent for Chester & Mary Broman, is a bay colt by American Pharoah out of stakes placed Kibosh, by Discreet Cat, from the family of champion Althea. Hip No. 292, a dark bay or brown colt by The Big Beast consigned by All Dreams Equine, Agent, is out of Loblolly Pine, by Officer, from the family of grade one stakes winner Riskaverse. Hip No. 295, a chestnut son of American Pharoah consigned by Q Bar J Thoroughbreds LLC, is out of Loudly, by War Front, a half sister to graded stakes placed stakes winner The Lady’s Groom. Hip No. 297, consigned by Bobby Dodd, Agent, is a dark bay or brown colt by Freud out of Love My Girl, by El Corredor, a half sister to graded stakes winning OBS graduate Leave the Light On. Hip No. 299, a chestnut daughter of Haynesfield consigned by Stephens Thoroughbreds LLC, Agent, is out of Love This Kitten, by Kitten’s Joy, from the family of graded stakes winner Admiral. Hip No. 301, consigned by de Meric Sales, Agent, is a bay colt by Palace Malice out of Lucky Song, by Unbridled’s Song, a daughter of graded stakes winner Caminadora. Hip No. 313, a bay daughter of Bayern consigned by McKathan Bros., Agent, is a half sister to stakes winner Mac the Man out of Marchmount, by Mountain Cat. Hip No. 316, a bay son of Into Mischief consigned by King’s Equine, Agent, is out of Marquet Rent, by Marquetry, and is a half brother to stakes winner Dashing Debby. Hip No. 348, consigned by Nice and Easy Thoroughbreds, Agent, is a bay filly by Daredevil out of stakes placed My Time Now, by Unbridled, a half sister to graded stakes placed stakes winner Cobra Classic. Hip No. 365, a gray or roan filly by Street Sense also consigned by All Dreams Equine, Agent, is out of graded stakes winner Now I Know, by Pure Prize. Hip No. 369, also consigned by McKathan Bros., Agent, is a dark bay or brown filly by More Than Ready out of graded stakes winner Omaticaya (IRE), by Bernstein. Hip No. 380, a dark bay or brown colt by Chitu consigned by RiceHorse Stable (Brandon & Ali Rice), Agent, is out of Party Starter, by Medaglia d’Oro, a daughter of grade one stakes winner Speeding Star. Hip No. 383, a bay colt by Paynter consigned by Hemingway Racing and Training Stables LLC, Agent, is a full brother to stakes winner Nanoosh out of Patrice Merion, by English Channel. The Under Tack Show continues at 8:00 a.m. on Saturday, March 9, with Hip No’s 385 – 577 scheduled to breeze. Hip No. 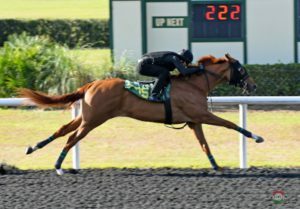 142, a son of Distorted Humor consigned by Southern Chase Farm, Inc. (Greg & Karen Dodd), Agent, sped a quarter in :20 3/5 to post the fastest work at the distance at the first session of the Under Tack Show for the Ocala Breeders’ Sales Company’s 2019 March Sale of Two Year Olds in Training. The bay colt is a half brother to stakes placed Glamoride out of Driven, by Forestry. Six youngsters shared honors for the session’s fastest eighth, stopping the timer in :9 4/5. Hip No. 24, an Irish-bred bay filly by No Nay Never consigned by Wavertree Stables, Inc. (Ciaran Dunne), Agent, is out of Anestasia, by Anabaa, a full sister to graded stakes winner Amonita (GB). Hip No. 31, consigned by Top Line Sales LLC, Agent, is a dark bay or brown son of Take Charge Indy out of stakes winning OBS graduate Appealing Stella, by Closing Argument. Hip No. 49, a dark bay or brown filly by Verrazano consigned by de Meric Sales, Agent, is out of Blue Bird Lady, by Congrats, a half sister to Yes She’s a Lady. Hip No. 81, a dark bay or brown colt by Justin Phillip consigned by Hoppel’s Horse & Cattle Co., Inc., Agent, is out of Cersei, by Malibu Moon, a daughter of grade one stakes winner Oh What a Windfall. Hip No. 134, consigned by Mayberry Farm, Agent, a bay filly by Wicked Strong out of Diva Girl, by Saint Ballado, is a half sister to stakes placed OBS graduate Petecarol. Hip No. 140, a bay filly by Karakontie (JPN) consigned by All Dreams Equine, Agent, is a half sister to stakes winning OBS graduate Aqua Frio out of Down The Well (IRE), by Mujadil. There were thirty eighths in :10 flat. Hip No. 16, a bay colt by Tapiture consigned by S G V Thoroughbreds LLC, is out of All About My Girls, by Distorted Humor, from the family of grade one stakes winner Halfbridled. Hip No. 19, consigned by Eisaman Equine, Agent, is a bay filly by Bernardini out of graded stakes winner Always a Princess, by Leroidesanimaux (BRZ), a half sister to grade one stakes winner Gabby’s Golden Gal. Hip No. 25, a dark bay or brown Competitive Edge filly consigned by Mayberry Farm, Agent, is a half sister to stakes placed Bluegrass Jamboree out of stakes placed Anjorie, by A. P Jet. Hip No. 26, consigned by Whitman Sales LLC, Agent, is a chestnut colt by Will Take Charge out of Annatlantic, by Stormy Atlantic, a daughter of stakes winner Classic Reign, a full sister to champion Regal Classic. Hip No. 29, a bay colt by Cairo Prince consigned by Q Bar J Thoroughbreds, is out of Another Dream, by Badge of Silver, from the family of millionaire grade one stakes winning OBS March graduate Sweet Talker. Hip No. 32, consigned by Top Line Sales LLC, Agent, is a gray or roan colt by The Factor out of Archangulus, by Empire Maker, a half sister to stakes placed You Know Too. Hip No. 36, a bay Super Saver colt consigned by King’s Equine, Agent, is a half brother to stakes placed Life of Illusion, second in the Bold Ego Handicap at Sunland Park in January, out of Atlantic Park, by Awesome Again, a half sister to graded stakes winner Gemswick Park. Hip No. 39, a chestnut colt by American Pharoah consigned by Bobby Dodd, Agent, is out of Avila Road, by Elusive Quality, a full sister to millionaire grade one winner and major sire Quality Road. Hip No. 50, consigned by Golden Rock Thoroughbreds, Agent, is a bay colt by Medal Count out of Blue Samurai, by Orientate, from the family of graded stakes winner Trick’s Pic. Hip No. 54, a chestnut colt by Brethren consigned by de Meric Sales, Agent, is a full brother to stakes winning OBS graduate She’s a Bullet out of Boston Image, by Boston Harbor. Hip No. 70, also consigned by de Meric, a dark bay or brown filly by First Samurai, is a half sister to stakes winner Sunset Ridge out of Cades Bay, by Fusaichi Pegasus. Hip No. 79, a chestnut filly by Justin Philip consigned by Stephens Thoroughbreds LLC, Agent, is out of Caution Sign, by Mr. Greeley, from the family of graded stakes winner Magicalmysterycat. Hip No. 83, consigned by Ends Well, Agent, is a dark bay or brown filly by Tale of the Cat out of Champagneandlilies, by Vindication, from the family of graded stakes winner Social Business. Hip No. 88, a dark bay or brown filly by Girolomo consigned by RiceHorse Stable (Brandon & Ali Rice), Agent, is out of Chilukki’s Song, by Elusive Quality, a daughter of champion Chilukki. Hip No. 92, consigned by Niall Brennan Stables, Agent, a chestnut filly by Speightstown out of graded stakes placed C J’s Leelee, by Mizzen Mast, is a half sister stakes placed C J’s Awesome. Hip No. 95, also consigned by RiceHorse Stable (Brandon & Ali Rice), Agent, is a dark bay or brown colt by Macleans Music out of Cocoa Cowgirl, by Cowboy Cal, from the family of stakes winner Mocha Queen. Hip No. 104, a bay filly by The Factor consigned by Bold Arrow Thoroughbreds, is a half sister to graded stakes placed Lily Pod out of Count to Eleven, by Grand Slam. Hip No. 116, Andthentherewasme, consigned by Brick City Thoroughbreds, is a bay colt by Palace out of Dark Fire, by Repent, a daughter of graded stakes placed stakes winner Madam Fireplace. Hip No. 118, a bay colt by Competitive Edge consigned by Golden Rock Thoroughbreds, Agent, is out of Daydawn (IRE), by Hawk Wing, a half sister to grade one stakes placed stakes winner Dr Johnson. Hip No. 120 is a bay colt by Shakin It Up consigned by Julie Davies LLC, Agent, out of D’ Chili Pepper, by D’wildcat, from the family of stakes winner Sleetwood Mac. Hip No. 127, consigned by All Dreams Equine, Agent, is a dark bay or brown colt by Cairo Prince, and is a half brother to graded stakes winner Smokey Fire out of Destroy, by Housebuster. Hip No. 136, consigned by de Meric Sales, Agent, is a dark bay or brown filly by Daredevil out of Divine Gift, by Divine Park, a half sister to stakes winner Lulu Wong. Hip No. 144, a dark bay or brown colt by Fed Biz consigned by Pick View LLC, Agent, is out of Electric Boots, by Bellamy Road, a full sister to graded stakes winner Georgie’s Angel. Hip No. 147, a dark bay or brown filly by Candy Ride (ARG) consigned by Top Line Sales LLC, Agent, is a half sister to champion Drefong out of Eltimaas, by Ghostzapper, from the family of champion Action This Day. Hip No. 157, also consigned by de Meric Sales, Agent, is a bay colt by Kantharos out of Fabiana’s Flash, by City Zip, a daughter of graded stakes winner Flashy n Smart. Hip No. 161, a bay colt by New Year’s Day consigned by Cary Frommer, Agent, is out of Ferdie’s Gal, by Fast Ferdie, a half sister to graded stakes winner Devil’s Cave. Hip No. 177, a bay colt by Constitution consigned by Wavertree Stables, Inc. (Ciaran Dunne), Agent, is out of Fort Afleet, by Northern Afleet, a half sister to graded stakes winner Calibrachoa. Hip No. 178, a chestnut daughter of Street Boss consigned by Cary Frommer, Agent, is a half sister to graded stakes placed Crider out of Frankie’s Lady, by Meadowlake. Hip No. 189, a bay filly by Munnings consigned by Top Line Sales LLC, is out of Ghost Galaxy, by Ghostzapper, a half sister to grade one stakes winner Red Giant. Hip No. 191, consigned by Sequel Bloodstock, Agent, is a dark bay or brown colt by Orb out of Glorious Success, by Successful Appeal, a half sister to grade one stakes winner Campanologist. Hip No. 55, a dark bay or brown filly by Uncle Mo consigned by Hoby & Layna Kight, Agent, is out of stakes winner Bow Bells, by Giant’s Causeway, a daughter of grade one stakes winner Marylebone. Hip No. 62, consigned by Ocala Stud, is a chestnut colt by Kantharos out of Brown Glaze, by War Front, a half sister to graded stakes placed stakes winning OBS graduate Lucky Livi. Hip No. 77, consigned by Southern Chase Farm, Inc. (Greg & Karen Dodd), Agent, is a gray or roan filly by Conveyance out of Catching Up, by Speightstown, a daughter of stakes winner Coy Cat. Hip No. 110, Jilted Bride, a bay filly by Wicked Strong consigned by de Meric Sales, Agent, is a half sister to stakes placed Quinnkat out of Cry At My Wedding, by Street Cry (IRE). Hip No. 141, a dark bay or brown colt by City Zip consigned by Wavertree Stables, Inc. (Ciaran Dunne), Agent for JSM Equine LLC, is out of Down to Hearth, by Giant’s Causeway, a daughter of stakes placed Seeking the Heart. Hip No. 169, a bay filly by American Pharoah also consigned by de Meric Sales, Agent, is out of stakes winner Flattermewithroses, by Flatter, from the family of graded stakes winner Fluttery Danseur. Hip No. 41, consigned by Eddie Woods, Agent, is a by colt by War Front out of Azzedine, by Mr. Greeley, a daughter of graded stakes winner Atelier. Hip No. 155, a bay filly by Lemon Drop Kid consigned by Boutte Sales, Agent, is out of Ever So Pretty, by Stormy Atlantic, a full sister to grade one stakes winner Stormello. Hip No. 180, also consigned by Eddie Woods, is a bay colt by Fed Biz out of graded stakes winner French Satin, by French Deputy, and is a half brother to graded stakes winner Long Haul Bay. Nine horses worked quarters in :21 1/5. Hip No. 1, consigned by Silver Star, Agent, is a chestnut colt by Fast Anna out of Yankee Bright, by Elusive Quality, a half sister to graded stakes winner Dijeerr. Hip No. 18, a gray or roan colt by Cross Traffic consigned by Southern Chase Farm, Inc. (Greg & Karen Dodd), Agent, is a half brother to stakes winning OBS graduate Killybegs Captain, recent winner of the Pelican Stakes at Tampa Bay Downs, out of Al Maha, by Holy Bull. Hip No. 22, consigned by Wavertree Stables, Inc. (Ciaran Dunne), Agent, is a bay filly by Munnings out of stakes winner Amiable Grace, by Alphabet Soup, a half sister to stakes winner Miss Tizzy. Hip No. 64, consigned by Hoby & Layna Kight, Agent, a bay colt by Tiznow out of Brush Hour, by Broad Brush, is a half brother to graded stakes winner Brushed by a Star. Hip No. 68, a bay daughter of Carpe Diem consigned by Tom McCrocklin, Agent, is out of Cabaret Starlet, by Tale of the Cat, a half sister to grade one stakes winner and Canadian Horse of the Year Arravale. Hip No. 86, consigned by Gene Recio, Agent, is a gray or roan colt by Uncle Mo out of stakes placed Charming She Is, by Johar, from the family of graded stakes winner Double Honor. Hip No. 102, a bay colt by Into Mischief consigned by Eddie Woods, Agent, is a half brother to stakes placed OBS graduate Orecchiette out of graded stakes placed Corderosa, by Aldebaran. Hip No.159, consigned by de Meric Sales, Agent, a dark bay or brown colt by Commissioner, is a half brother to graded stakes winner Fair Point out of Fair Rose, by Harlan’s Holiday. Hip No. 185, a bay colt by Into Mischief consigned by Eddie Woods, Agent, is out of Game Show, by Deputy Minister, a half sister to grade one stakes winner Pike Place Dancer. The Under Tack Show continues at 8:00 a.m. on Friday, March 8, with Hip No’s 193 – 384 scheduled to breeze. 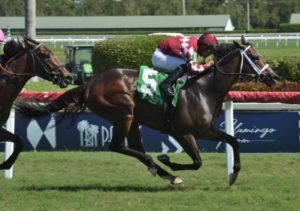 OBS graduates posted a pair of graded stakes victories on Saturday at Gulfstream Park.